Not many things merit a 5:00 a.m. start and an uncomfortable four-hour bus ride with terrible leg room. But it is my last day in Beijing and I have booked myself a trip to see the final item on my checklist: the Great Wall of China. Backpack tucked between my feet, I am trying to decipher the language that is being spoken by my seatmate. Is it Portuguese? I wonder. There are words that seem almost Spanish, but it lacks the familiar lilt of my Brazilian friends. I keep my eyes glued to the window, watching the scenery as it turns from drab apartment blocks to tan-coloured fields and mountains. There are 33 of us on this bus; a group of Frenchmen, a myriad of other nationalities and a visiting professor from New Jersey. He seems to be the only other person who is going solo. We walk the wide pathway leading to the start of the trail, where we are herded between the rest of the villagers. I hear the numbers being recited in Mandarin and sigh, wondering if I had made the right decision. “What are they saying?” A blonde twenty-something ahead of me turns around, creases of bewilderment forming above her sunglasses. I had hoped that the vendors would leave us the moment we began our ascent, but this being China it was wishful thinking. Backpacks stuffed with merchandise, it wasn’t long before they followed, spreading out strategically among the group. In a bid to be friendly, I call out to the ruddy-faced villager who is just passing me by. “Aren’t you cold? You don’t seem to be wearing very much!” Her shoes are flat-soled and seem impractical for the hike. 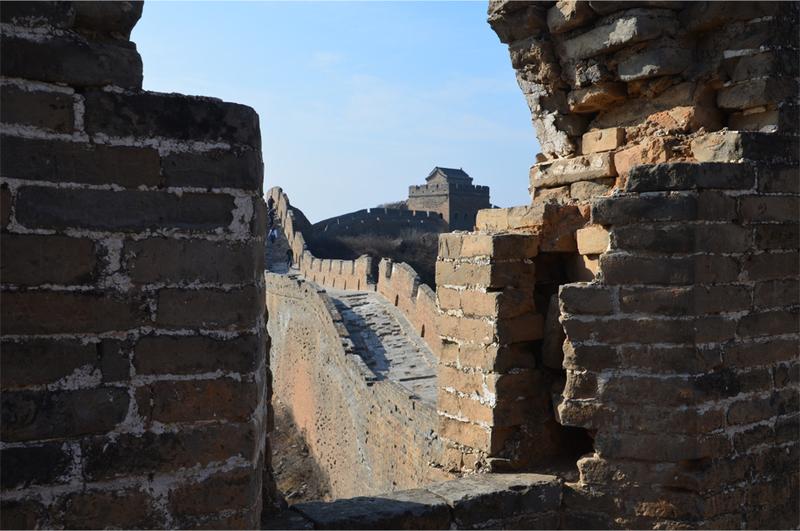 Zhou is more than happy to share her knowledge of the wall; she reveals details that our guide would mention only in passing or neglect altogether. The posts where pillars once held up the mighty watchtowers; scorch marks and bomb damage left by invading Japanese troops; and hidden portals where horses would bring in supplies from the valleys below. Zhou is walking ahead, warning me where it’s dangerous or slippery. Eventually I stumble, sending a few pieces of rubble tumbling down the slope. “Man man zou,” she chimes. Walk slowly. I had bought a pair of brand-new hiking boots for the trip, but failed to break them in before climbing the wall. It is at this point that Zhou begins describing her life in the shadow of China’s pride. She continues, right palm pressed against the cool brick, taking it one step at a time. “We’ve lived here all our lives. Been here for generations. Our ancestors and their ancestors too.” Perhaps, I muse, they were the ones who built and maintained this wall. She speaks of her two daughters with the pride of any mother. They are seven and eleven years old, and spend their weekdays living at a boarding school some eight kilometres away. At the final tower, nicknamed “the one with five eyes”, the other hikers are preparing for their descent. An Australian gazes out over the scene and puts her arm around her partner. In the distance the wall at Simatai stretches out into the midday haze. I sit in the doorway, marveling at the view and for once, the unadulterated silence. On the way down Zhou takes me via a winding route on the mountainside, bypassing the steeper parts of the wall. “Beware the loose stones,” she says. I stumble again, and wonder how she can jump from place to place with such graceful ease. In the shade patches of January snow line the worn dirt path, melting slowly into gentle dunes of shaved ice. I dip my finger into the snow and relish the cold. I think of my small donation, her two daughters, and the sacrificial act of a mother yearning to give them a better future. I really enjoy reading your post but can you please add share button? Its a shame not to be able to post something so good on faceboook, twitter, stumbleupon…. I’ve just added a share button to the bottom of each post. Thanks for the feedback! It’s incredible to see the expanse of the Great Wall. Truly a wonder indeed. The view is breathtaking as well. By the way, did you just pick your guide randomly? 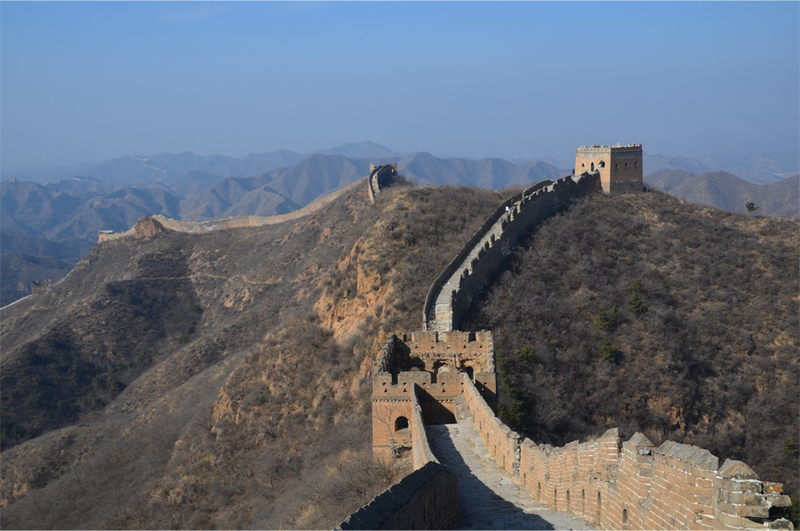 if so, you were very lucky to have a nice person like Zhou Qin who told you some interesting facts about the wall. Yes, it was completely random – our official tour guide was clearly a novice and he only told us things that I already knew. So I was very happy to bump into someone like Zhou. What a great experience! I would love to visit the wall. I hope I find a guide like yours. 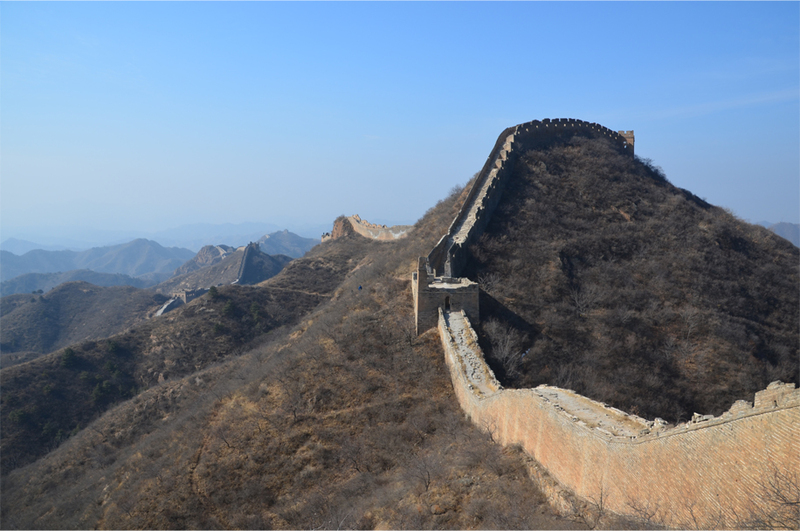 If you do visit the wall, I would highly recommend the section at Jinshanling. It’s farther away from Beijing than the other, more famous portions, but that makes it much less of a tourist trap! You do write well, and the personal titbits (here Zhou’s stories) give charm and originality to your narrations. You’re welcome Lou! I really appreciate your kind words – this post in particular was quite the labour of love. I did find you on FP, congrats, and then looked at all of the feedback and found some others to follow based off of their comments to you. Thank you for the well written memory and pictured adventure, along with the new blogs I am now part of. Thanks in turn for the kind words, Hanel. As you said, it’s far more interesting to get a feel for a place through its people. I too am irked by that tendency to write about one’s travels in a self-absorbed manner… frankly the locals aren’t going to make a distinction between whether we are “tourists” or “travellers” – at the end of the day we are all just strangers passing through a foreign land. Beautifully written James! Loved every word! Jinshaling looks so desolate and wonderful at the same time! We decided we were not fit enough (or not young enough!) for this section and opted for Mutiyanyu. Your post makes me wish we hadn’t! Thanks Madhu! Actually, Jinshanling is a lot easier than it looks – all you need is a good pair of shoes and plenty of time for the hike. Haven’t been to Mutianyu but judging from the pictures it seems a lot steeper than I thought! Wow James! Your photos are unbelievable! Looks like you had an amazingly clear day. I am so jealous as our day was so smoggy. Did you enjoy this section of the wall? I was in Beijing for an entire week and only two days were smoggy – I was not expecting so much blue sky so you can imagine how happy I was when I got there! This part of the wall was simply incredible, I only wish the hike was twice as long so I could see more of it! My last visit to Great Wall was 10 years ago! Thanks for bringing up the memories when I was in Beijing. I doubt that the Great Wall has changed much in ten years, even if Beijing clearly has! Thanks Annette! There were a few stumbles here and there, but this wall is not really as difficult as it looks! Thank you Lucy, I really loved your photos of Antigua! Thanks James! Looks like I’ll have to keep an eye on your blog! I’m headed back to SE Asia this year. Where do you plan on going? I’ll be off to Laos in May, with a short stopover in Kuala Lumpur. Considering how close I live to SE Asia, I haven’t seen as much of it as I should have! I’m going back to Thailand. I used to live there and I want to see if I want to live there again. I’ve lived in Guatemala long enough and am craving Thailand again! I miss SE Asia and traveled quite a lot there when I was living over in that part of the world. I loved Laos although I was there quite a few years ago so I’m sure it’s changed quite a bit! Happy travels! I look forward to seeing more of your photos! Thanks Lucy! Thailand must have been an incredible country to call home, I’m not surprised you’re longing to go back! After spending 9 months in Spain I would love to try out Central and South America. I hear Luang Prabang is becoming increasingly touristy – so I’m hoping to get there before it becomes SE Asia’s version of Prague! Thailand has been calling my name for years but I’ve never quite made it back. This is the year! Both Central and South America are incredible places to travel. Each country has something different to offer in landscape, food and culture. I loved Luang Prabang when I was there but it was well over 10 years ago and although there were backpackers there it wasn’t overrun and still had plenty of charm. I hope it still does! I hope to travel in Laos again when I’m back over that way. Thanks Daniel! I couldn’t believe how lucky I was with the weather that day – it was cold but perfect for pictures. its beautiful! what a great post and awesome pictures!!! The Great Wall is absolutely stunning in real life! Great photos! I, too, visited the Great Wall in the winter. I’m glad I did. There were very few tourists. Although the landscape was pretty brown, the experience of being there without having to fight the crowds was worth every frozen moment of it. I couldn’t agree more – we were the only ones on the wall and that made it a very special experience. I would love to go back and see how it looks in the fall. Your entry just reminded of a National Geographic Great Expeditions documentary entitled Walking The Great Wall. I love the personal tone you use when you tell the story. It was almost heartwarming, esp the part about asking the vendor if she goes up there and answering that she sells souvenirs to earn money so she can send her kids to school. I was really touched by the vendor’s story – it made me realise just how privileged I was to live the life that I have. Nice photo. Your post make me miss my home in China so much. I will reblog your post to my Chinese teaching blog. I will teach “长城” (the Chinese for “the Great Wall”)! What an honour to be able to teach Chinese – it is such a beautiful, poetic language. Thanks for the reblog Xuan, 谢谢! Thanks:) Looking forward to more of your posts. Cheer!! What a fantastic experience this must’ve been. It’s now on my bucket list of things to see. Thanks for sharing! You’re welcome Janet, it was one of the highlights of my trip! Great post! reminds me of my own trip to the Great Wall, we even camped out on it, thank you for the great pics also. Wow, that must have been a wonderful experience! I bet it was a great place to lie down and watch the stars. It really is, this was my third time on the wall and it completely took my breath away. That is quite an experience. Its special that you made such a beautiful connection with a lady of the area, and in turn, that you were able to financially assist her (through your purchase). I can not imagine what it is like to be so poor, as I am sure that most of us in the west can not. Thank you for sharing. Beautiful story with gorgeous photos. It really brought on a fresh perspective – there are so many things that we take for granted, for instance running water, electricity and the right to education. I felt absolutely humbled after meeting the lady. I was on the Great Wall in January 2009. This was nothing like my experience. You really had a “treat”. Having a native person spend the time with you and show you the details is really the experience of a lifetime. Your trail was so much more rugged than mine, also. The section of the wall I walked had been rebuilt for the protection of tourists so it was in much better shape. I was happy to see your photos to get a sense of the steepness and the deterioration of the wall left in its natural state. Thanks for this trip down memory lane for me even though it was a bit different. I am heading over to your Hong Kong post now. I could not have asked for a better guide; meeting her made the experience that much more rewarding. 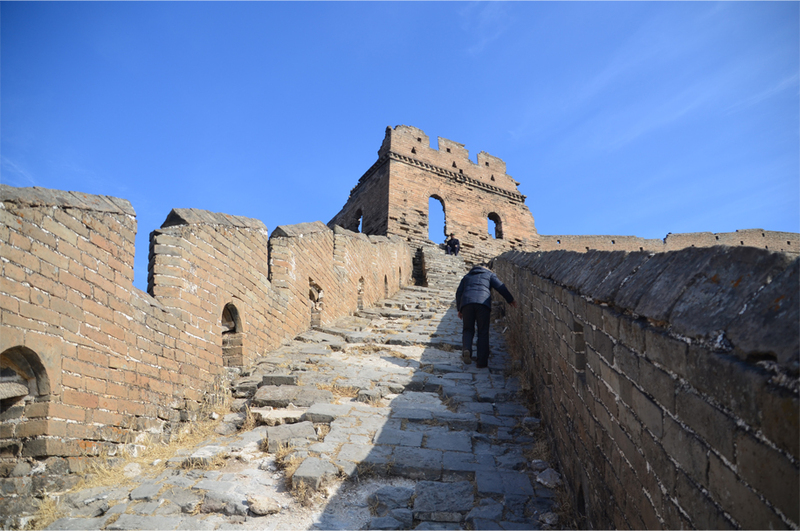 I may have been on that same section of wall quite a number of years ago – was it called Badaling? All I remember are the crowds and the souvenir stalls, not much else! Yes, it was the tourist “trap” place where you entered via cable car. I am really not sure why my hosts took me to that particular starting point. Stephen was a native from Hong Kong so I really got to see a lot of true Chinese neighborhoods, see their customs and eat the traditional dishes throughout the mainland. My best experience was in a tea shop with a young woman who shared her dreams of studying abroad while she demonstrated the way to brew tea to maximize its flavor. As she brewed she talked about how she could not see a way to break away from the family’s street business of selling loose teas to tourists. That was in Xien. I wonder how that young woman has fared since you met her – so many of her age dream of going abroad. such a spectacular place, I hope to get there one day too. What a journey, thanks for sharing. You’re welcome, I’m sure that someday you too will make the visit! Really great story-telling through both your pictures and words. If you’re not a writer by trade, you definitely could be one. This is the kind of quality travel-writing one would expect to see in a magazine or newspaper. Like the esthetic of your blogsite, too. Cheers. My background is in architecture but I am considering a career change to journalism – travel writing is my secret passion and I would love to work for a company like National Geographic. Thank you for leaving such a kind, encouraging comment! Great stuff. Thanks for sharing. It was great to relive my brief time at Simatai through your words. You’re welcome, Jason. I made it right to the edge of Simatai but it was closed for renovations. Hopefully it will still retain its charm when the authorities have that stretch ropened. I wonder if the wall will be somewhat restored…or if that would damage it’s appeal. Part of the section I walked was restored about 20-30 years ago; they did a pretty good job but I think I still preferred the more ruined parts! How many people and how many years did it take to build this wall? I could not sleep if those questions were not answered for me. Your photos are great, and your narrative is very good. Thank you for sharing. I am adding a visit to the great wall to my bucket list. We need a wall such as this between our southern border to impede the flow of people streaming into the USA. I’m not sure about the exact figures, but the wall that we see today was completed in a period spanning more than 100 years. Thanks for dropping by! Thx for showing still the amazing serpentine structure of the Great Wall. 70 % grade walk? I can’t imagine going down the rubbly stones. I haven’t been to China ..yet. Fortunately the 70-degree climb only lasted for a few minutes! The wall is actually easier than it looks in the photos. Great wall and of course great post ! I really enjoyed reading about your experience at the Great Wall. I’d like to take my kids there (5-9yo). Did you see many kids visiting? My kids are hardy, but not sure I’d take them to the slippery slopes. In the group I went with the youngest hiker was in her mid-to-late teens. 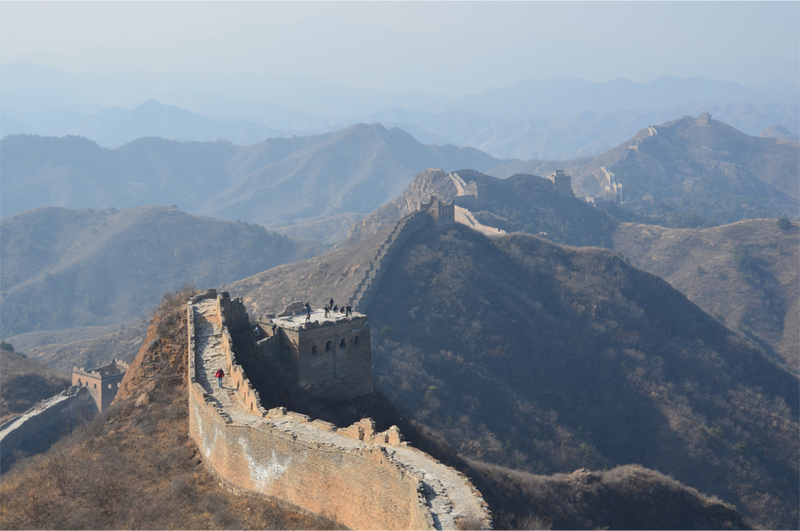 There are a few other sections of the Great Wall that are safer and more child-friendly, but as they are closer to Beijing they tend to attract much bigger crowds. Badaling is too crowded compared to Jinshanling. That is one of the main reasons why some travelers prefer Jinshanling over the other. Besides that, Jinshangling is well kept in its original shape while Badaling has been rebuilt many times. Absolutely love the pictures, my favorite of the Wall, and the personality of your writing. Thank you Jessica, it was a real pleasure to write this post! Hi there! Was on the Great Wall with my students about four years back. I only made it up two towers before my legs refused to go any further, so kudos to you for having made it all the way to the end! By the way, is your stretch of the Wall the one which ends in a tourist store? I can’t remember which section we went to, but it was definitely crowded with tourists and hawkers alike. If that wasn’t Jinshanling, how would one get there from Beijing? Hi Cecille! 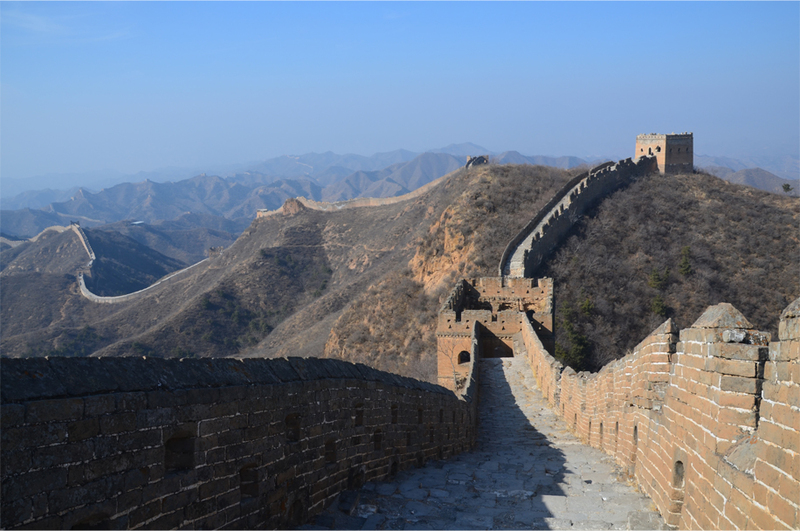 I think you may have visited either Badaling or Mutianyu – judging from your descriptions, it sounds like you did the latter! We had vendors in Jinshanling, but it was relatively undeveloped so there was no tourist store at the bottom. 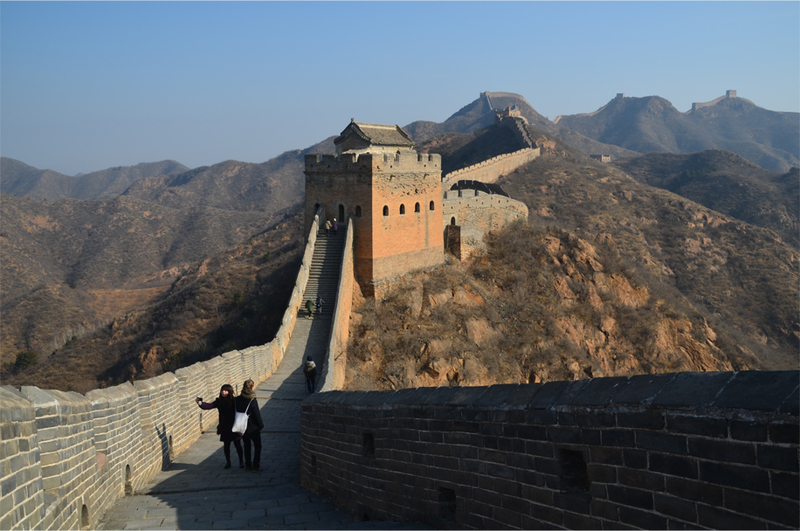 I got there by booking myself onto a group tour via an independent hiking company; it was called “Great Wall Adventure Tours”. Just went here back in late February, snowed the day we went and was absolutely gorgeous. Great pictures. I was hopeful for snow but there was none when I was there in early February – it seems like I may have gone a few weeks too early! James loved your blog on the Great Wall. My husband and I lived in Beijing a little over a year in 2008 – 2009. 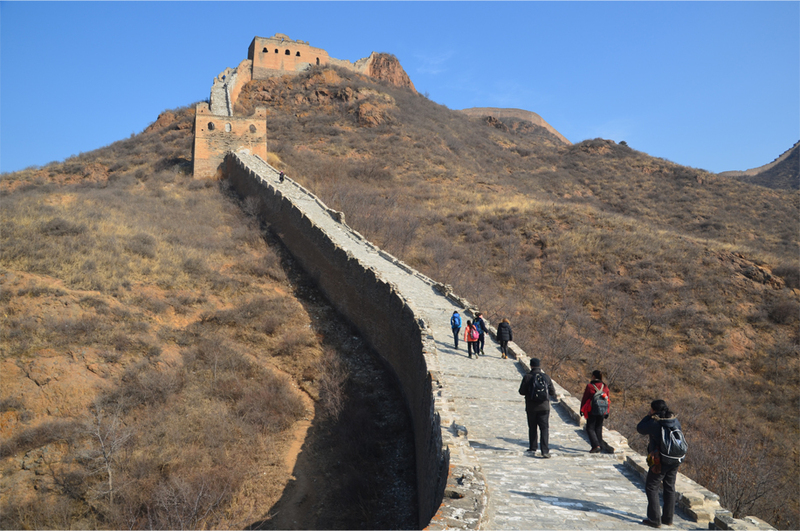 We were very fortunate to have the opportunity to hike the Simatai portion of the Great Wall. We had pictures very similar to what you have, but unfortunately they were lost when our computer crashed, so it’s nice to see your pictures. We actually stayed overnight at one of the farmers houses there below the end of the route. We did not speak Mandarin and he spoke very little English. He started by walking with us through town. We could tell he was excited to have visitors and was bragging to the other locals that he had visitors. We had both a traditional dinner and breakfast, which was excellent. The house consisted of a living room with their bedroom, three guest rooms, one bathroom with running water, and a kitchen surrounded by a small court yard, where we ate our meals. The bed consisted of a thin foam pad on two by six boards and was covered by a handmade quilt. It was an assume experience, one of greatest places we have ever visited. April and October are the best months to visit China. I recommend the Harbin Ice Festival if you are ever back in China, but be prepared to wear a lot of warm clothing. Wow, what an experience that must have been! I considered staying overnight below the wall but only a day trip was possible with the time that I had. Thank you for recommending Harbin and sharing such a wonderful account of your stay – I will have to check out the ice festival in the next couple of winters! Well written post. I’ve been to a few different sections of the Wall and wrote a post about it a couple months ago. Here’s a link in case you’re interested in checking it out. Thanks Jimmy, I had a look at your post and I recognise Jinshanling from the last picture. Were you there in the summer? I’m amazed by the clarity of the scene – I don’t remember seeing those distant mountains from the wall. The section at Huanghua looks absolutely gorgeous! I was there last May. It was a super clear day, and the lighting was great for pictures. I definitely recommend Huanghua if you make another trip to the Great Wall. There was almost no one there the day I went. It was really serene, and quite a different experience from the more touristy sections of the wall. This is one of the best set of photographs and one of the best written narratives I’ve come across about the Great Wall. Hope to see you put together a book someday about all your travels and all the lessons learned on the road, James. Thank you LL – that’s a very flattering thing to say! I agree! Have taken notes so I know where to go (before I am 85…). Love the personal info shared by the guide; rice potholes, etc.! Probably no-one knows! This is truly magnificent! The best I’ve seen about The Great Wall. Very well written and interesting to read. Traveling has been a great part of my life as well – although I don´t travel that much anymore. To China and the Great Wall I have been a couple of times, and to my great joy we brought our young over there as well. The last time when we went further on to Tibet. Keep going while you are still young! I know the feeling you have and the ache in your body for more. Wonderful photos as well! I will have a thorough look around your blog, and I agree with someone LL above – why not making a book or two about your travels? Ah, I’ve always wanted to go to Tibet. How did you cope with the altitude sickness? Was it much of a problem while you were there? It can be hard to take time off to go travelling, but thankfully I have a trip to Laos and another one to Southern China (Guilin and Yangshuo) planned next month. Thank you for leaving such a thoughtful comment – I have never been to Scandinavia but I hope to visit sometime soon! I went to New Zealand during christmas and stayed for a month – I wish I could have stayed longer, because this is the most beautiful country I have ever visited. Nature there is simply astonishing. Their work to keep it clean and nonpolluted is admirable. Mountains, glaciers, hot springs, volcanoes, green hills, fiords and rainforests together in beautiful harmony! And the wildlife! Tibet, yes. This journey was extraordinary – it has been in my dreams ever since I read about Shang-ri-La as a child. I´m so glad I made it before getting too old…No, but I think altitude sickness does not depend on how fit you are. You cannot tell in advance how you will react. Of course, if you have some kind of lung deficiency or if you are a smoker – its not optimal. We all (4 persons) handled it very well. My experience from Peru is that you should have a slow ride up there – if you can you should rest often. We went by the rather new train from Beijing to Lhasa and flew back again. We had a van taking us higher up inside the country and there were never any problems. The first week I woke up with headaches every day, and during night we all had some short breathing stops. We had read about it thoroughly in advance, so we were not afraid. Of course you might refrain from climbing the Potala steps the first days of your stay. We saw several people throwing up when they reached the top level..
Tibet is wonderful, you would love it. One of my dreams is also to go to Guilin – but I fear it will not come true. I´ve heard they are going to flow it in order to build a great dam or something. Hope you will get there in time! I think I will look out for your pictures and story! Good Luck! New Zealand is just remarkable – I went there as a 12 or 13 year old one Easter, and although it rained almost every day the scenery was second to none. On the way to Milford Sound I saw snow and ice for the very first time… I will always remember how it felt on my hands. The mountains of Guilin are safe for now; they had the dam built across the Yangtze River Valley some way to the north. Like Lake Nasser in Egypt, some of the historical monuments in the Three Gorges were dismantled and reassembled higher up the slopes. But it’s still a big loss to China, the reservoir is apparently the size of Switzerland! And thank you for the generous offer of a place to stay in Sweden, I am really touched by your kindness. Maybe someday we will swap travel stories face-to-face! As I said, you are welcome to contact me if…And, did you know that it was a Swedish company that dismantled and rebuilt the Abu Simbel? We flew in over the great dam and the magnificent temple an early morning in 1981…Once again – Good Luck with your future travels! what a sweet story… I am sure it enriched your view of a famous land mark that much more. It certainly did – my guide was unbelievably open about sharing her story. Your pictures of the Great Wall are beautiful! I really enjoyed reading your narrative as well. 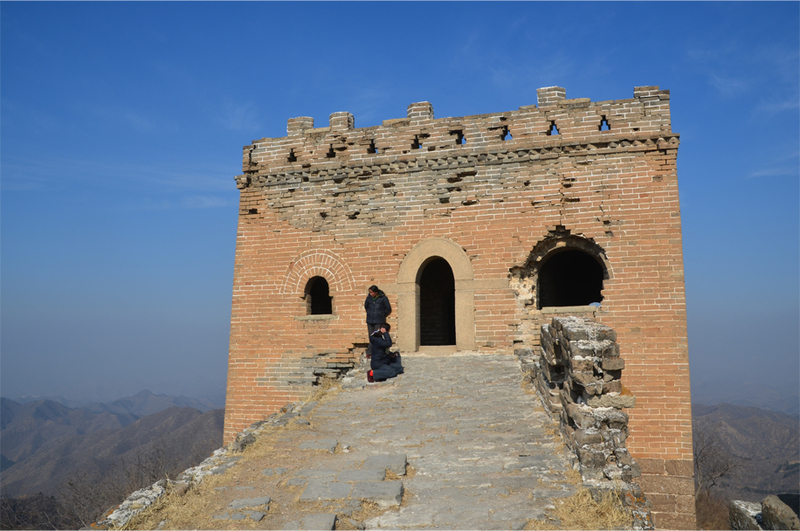 My husband and I went to the Great Wall last October, but we went to the Mutiyanyu portion and we had no travel guide, so we had quite a different experience than you. Our trip was a little marred by the dense crowds and the seemingly endless vendors…it would have been cool to visit the unrestored, crumbling part of the wall like you did. I saw in one of your other comments that you plan to visit Guilin and Yangshou soon! My husband and I also went there this past January, and we really enjoyed it! I’ll definitely have to come back to your blog to take a look at the pictures you take. You may already know all about it, but our advice would be to spend more time in Yangshou than Guilin–it’s much more scenic and underdeveloped. The vendors at Jinshanling were persistent but not nearly as bad as the more popular sections – I found that as long as you remained friendly they were generally okay. Thanks for the advice! I’ll be spending about 3 days in and around Yangshuo, and 2 in Guilin. Joining me will be a fellow travel blogger – it’s his first time in China outside Hong Kong and Macau, so I’m hoping that it won’t be too much of a culture shock! The plan is to land in Guangzhou, stay the night and get to Yangshuo by bus. Did you manage to take in the Longsheng Rice Terraces while in Guilin? I love the title of your blog, it speaks volumes about the full-on Chinese experience! I was actually considering doing Longsheng on my own but your story has made me think otherwise! We’re going towards the end of May so the timing will be just right. Thanks again for the tips – I’ll keep an eye out for those honest menus in Guilin! That was a wonderfully written photo essay. Thank you for posting this. This is what traveling is about! Absolutely Rica – good luck with your plans for China & Laos! Thank you for sharing this simple yet enriching story. It is amazing what our simple acts of giving can do for others. These are the kind of moments that stay in our memories. Also, the photography was a beauty to look at. Thank you Leah, the pleasure was mine. James, what a great post. Loved your pix (the ones my computer could actually load) and your write-up too. My husband I lived in China and Hong Kong for many years and were able to visit the Great Wall several times. I really enjoyed “going back” there with you in this post. It is an incredible feat of engineering, effort, blood, sweat, rice and tears. So glad you could share it with us. What a great story! Nice pictures, too! I went there with a rough start haha, as I couldn’t get myself on a tour. I had contemplated going alone, but as I wasn’t clear about how to get there a tour seemed like the best option. In the end I managed to find one just a day ahead! You are a very good writer! This was a real catchy one, I cannot stop reading til the end, it’s like a short story, this should be printed out! 🙂 cheers! Salamat Joycelyn! One day I will make it to the Philippines and blog about it – the islands are right there at the top of my wishlist! Wow! That is great to hear! If you don’t have any friends here, I can come with you! There’s so many things worth sharing about our country. 🙂 Keep it up! God bless! Great story, and masterfully told. Your pictures really do the wall justice. Thank you for the compliments, this was an experience that I knew I just had to share! I enjoyed your tour. I particularly liked it because you brought a sense of intimacy to it, and the fact that you included a narrative with the photos. So many authors don’t, and so all that results is a photo gallery of pretty pictures. With this post I felt like the written content spoke louder than the images. Thanks for leaving such a kind comment, Gerry – I really do appreciate it! Thank you for sharing. Loved the pictures. I enjoyed reading your experience. I am so glad(I know its weird)that you met someone like Zhou Qin, cause somehow, though the place is lovely, the trip becomes memorable because of the people we connect with. I completely agree, it would have been far less of an experience without her! Amazing stories and stunning pictures! Thank you for sharing! 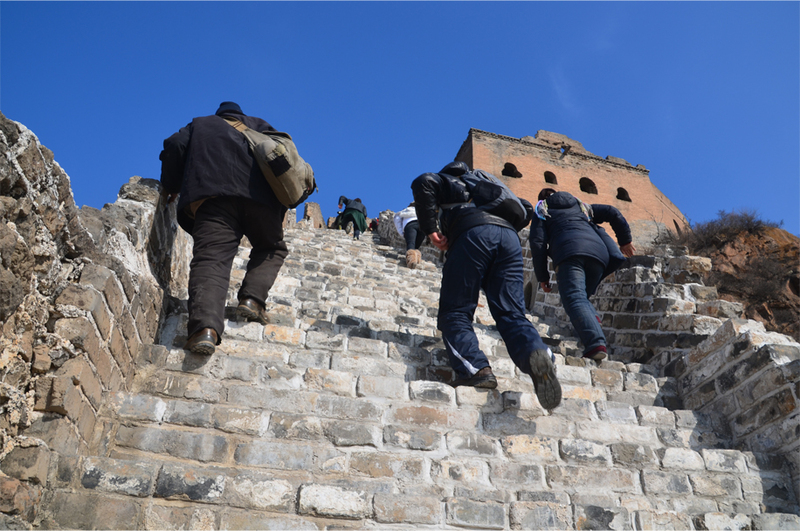 I’ve heard that because of all the foot traffic on the Great Wall, it has become very uneven. Is that true? You’re welcome! Regarding the foot traffic, the more popular parts of the Wall are often heavily restored so it’s not much of a problem. In contrast the section I went to was relatively undeveloped – I would say that the uneven surfaces were due to years of general wear and tear. Thanks for the memories! I hiked the Great Wall last summer. It’s amazing the lengths Great Wall vendors will go for a sale, isn’t it? You have to admire their determination! Most come away from the hike empty-handed, especially in the winter when there are less visitors around. Hi James! Congrats on the FP! I read this post awhile ago and then saw it on the front page! Way to go! I love the way your new theme looks on the blog. How on earth did you get the background? It is so cool! I am working hard at revising mine. I’ve tested a few themes and its been a nightmare as I don’t know how to program it. Delicious Magazine is one I looked at. I also like the new one On Demand but could not get it to work for the life of me. You are so lucky your day was clear at the wall. When I look back at my pictures from my Climb on the Wall series I noticed that it is so incredibly smoggy! Oh well. Guess I’ll have to do it again someday! Thank you Nicole! I found the background image off google – it was originally white but I combined it with a faded texture in photoshop. Delicious Magazine took a while to get used to, I wasn’t too keen on the original fonts so I had them changed with Custom Design. I was expecting some really smoggy days in Beijing but most of them turned out with beautiful blue skies. If you do go back you should definitely try out this part of the wall! You must be really good at figuring out how to put all this together in WP! I would have no clue on how to do that. Hopefully someday! It looks great! Did you have to use a lot of CCS in order to customize your site? Or was it pretty straight forward using Delicious Magazine. A lot of it involved trial and error – I basically supersized the writing as it was practically unreadable! The spacing wasn’t right either so I used CSS to adjust it. It’s a shame because I thought the typography was perfect on the previous theme! Your site is really outstanding. The pictures are truly wonderful. Beautiful background. I have enjoyed looking around your great posts. Congratulations on being FP. Reblogged this on KAJ's Blog. This is brilliant! 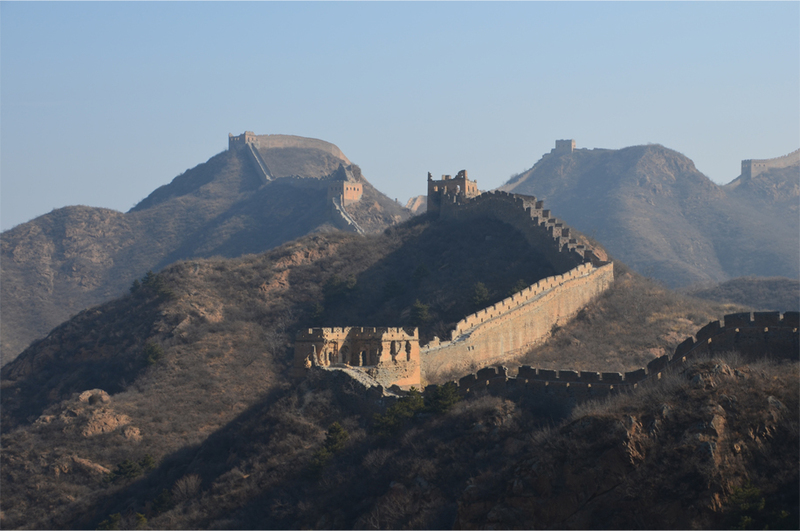 The Great Wall is high on my to-do list and your pics/writing makes me want to go even more! 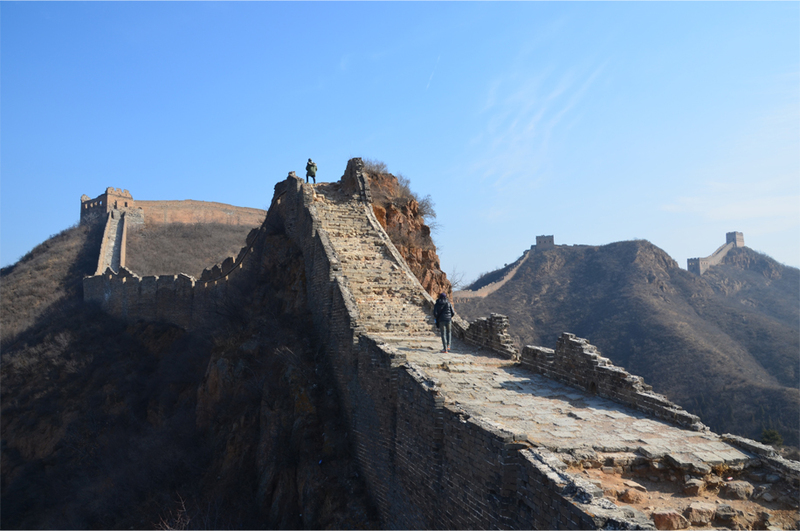 The Great Wall should really be on everyone’s bucket list – it is just astounding! Lovely photos. I camped and hiked Jinshanling last summer and it was incredible. Remote, rugged, and, amazingly enough, smog free on the days I was there. Such a gorgeous area, love the pics too. Any chance you got to hear the nearby military base testing ordinance? It must have been so beautiful in the summer – I would have loved to see the sun setting over the wall. Perhaps the military base was having a quiet day when I went, I didn’t hear a thing! I very much enjoyed this post – you really brought being on the ‘Wall’ alive, and the photos are brilliant! My husband is currently on an 8-day motorcycling tour around southern China – I hope he has some good shots that I can share with you. Sounds like your husband is quite the adventurer! I have just subscribed to your website and am looking forward to reading the weekly updates. This is one of the best writing pieces I’ve ever come across. amazing pics! seems like you travel SE Asia a lot, esp. China. Thank you Axelle, what a flattering thing to say! Truth is, I haven’t seen as much of SE Asia as I would like – however I do have a trip to Malaysia and Laos coming up next month. how inspiring! I especially enjoyed reading about your guide’s life, and how you made her day by spending a few dollars. How lucky are you to have had this experience. I can’t wait to one day visit the wall and have an inspiring encounter for myself! I was really not expecting such a meaningful encounter, it had to be one of the greatest moments of the trip. When you get to the Wall make sure you write a blog about it! I love Great wall, I love Beijing, I love China. I always dream to visit this great wall. You can always make that dream a reality. Great post, really, really enjoyed reading this. p.s. awesome pictures also. Looks incredible. Thank you Gemma, it felt surreal to be standing there on top of the wall! What an incredible story! I was planning a year in China when a job opportunity came up and I ended up in Egypt instead! Reading this entry has made me definetly want to go. Not for a year but I must see the Great Wall one day. Egypt must have been an incredible place to live! 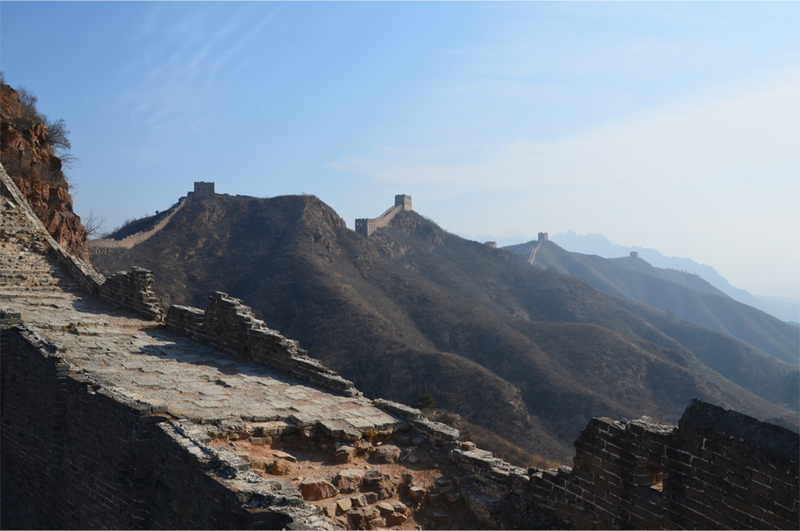 When you do go to the Great Wall, make sure you visit a section farther away from Beijing – generally there will be far less crowds and souvenir vendors. Noted! The vendors can not be worse than the ones at the Pyramids in Cairo. The day I went they outnumbered the tourists 50 to 1! Thanks for the warning – I had absolutely no idea! This is a place I’ve always wanted to go. Don’t know if I’ll make it, so it’s especially nice to see such a thoughtful piece. Photos are great, and I love the illustrations in the background of your blog. Where are they from? I’m sure you will make it – once past the air fares travelling in China is really affordable! The background image is taken from a drawing of Hong Kong Harbour done in 1845, not long after the British took possession of the island. Congratulations on being freshly pressed. What wonderful pictures. Thank you for sharing them with us. 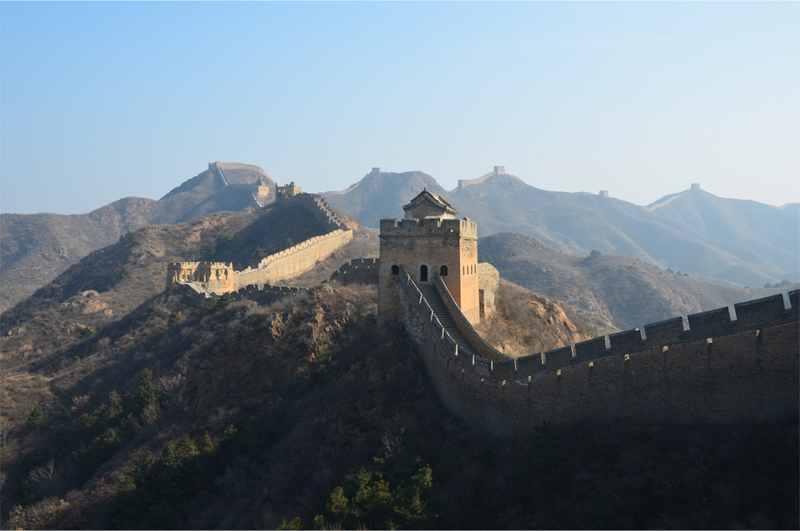 One day I hope to go to China and the Great Wall is on my list of things that I must see. Thank you Kerry, it looks like you are living the dream in France! Yes – it is lovely here. Not as exotic as some of the places you have visited but well worth a visit if you come back to Europe one day. Sadly I’ve only seen Paris, Nice and Strasbourg. A close friend of mine lives in Lyon so I’ve promised to visit her at some point. And I’ve always wanted to tour the Loire Valley for its chateaux and wine. It’s funny how the term “exotic” is so relative – to those of us living in Asia, Europe is just that! The Loire is lovely as is the Bordeaux region – full of lovely châteaux and cars abandoned from people who have ‘tasted’ a little too much. You are right James – exotic is very relative!! Thanks! I LOVE the emphasis on food on your blog… and I’m looking forward to reading more about your Spanish escapade! Thank you, James, for the pictures and the tale. I had a Great Wall misty experience, twice. Not so lucky with the shots, although the mist gives it all an eerie and ghostly look…I’m very happy to see yours. Makes me want to go back, for sure. Enjoy the rest! De rien, Julie. What a shame about the mist! Not many people have a trilingual blog like yours, that is really incredible. Yo escribiría en español, si no me costara tanto! Thanks. Still learning. how to write and how to blog. ha! Love to share. Let’s keep on traveling! Thank you for sharing your adventure and pictures. I enjoyed them. You’re more than welcome – thank you for dropping by! 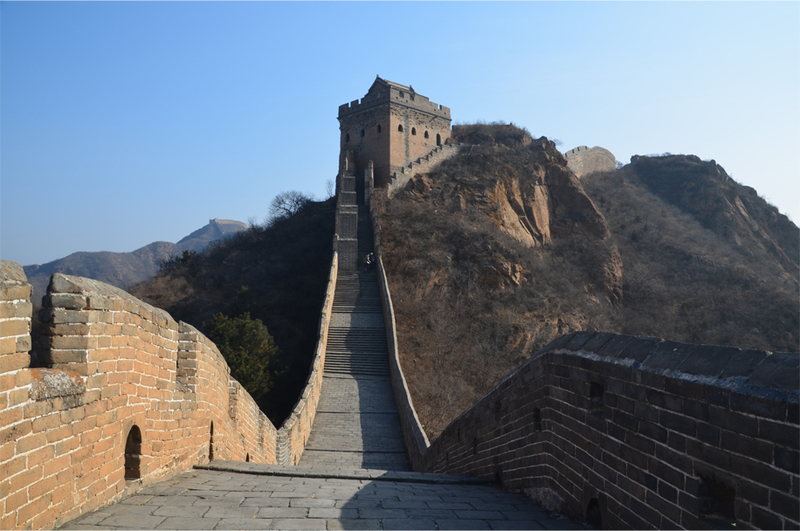 I have always dreamed of being able to go to China and to walk on the Great Wall. When I was 9 years old my Grandfather was invited to come and live in China for one year and teach English. It was decided that I, as his oldest grandchild, would accompany him. I remember searching the library for every book I could find about China (long before the days of internet) and devouring every fact I could about the mysterious land of the Golden Dragon. Sadly, Grandfather became ill and our China adventure was postponed, and then eventually was cancelled and never materialized. Nearly 40 years later, I am still waiting for my chance to experience China. I loved reading all of your descriptions and seeing your beautiful photos. You have captured very well just how steep and treacherous the wall can be, and how infinite it seems to stretch. Do they let people hike along the wall unaccompanied for an extended period? Like trekking? Or, is it very controlled how far you can go? I especially loved reading about your unique personal experience of meeting Zhou Qin. I’m very glad that you purchased some of her souvenirs and supported her family. Thank you, MoSop – what a story! It is never too late to make the trip, it would be such a moving experience to visit China in your Grandfather’s place. There are a few parts of the wall that are closed to visitors but otherwise you are free to go trekking on your own – it’s even possible to camp overnight on the less popular sections. I hope that you too will get there sometime soon! Thank you, Cori! 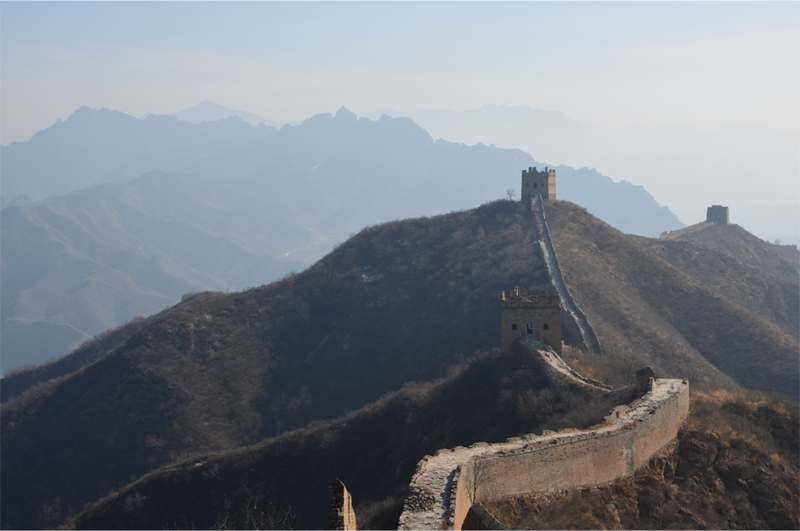 It really is something else – I don’t think anyone could go to China without seeing the Wall! My little brother is currently on a two month break from teaching English in Thailand and he is dying to travel to the Great Wall. With your pictures and expert storytelling, I feel like I have made it there first. I hope that you will both have the chance to visit in the near future; the world is getting smaller by the day. Thanks for the inspiring words! A great post! Reminds me of my time in the Great Wall too last year. We only went to Mutianyu, and it was already a tough climb for me. I was really tired after a few days in Beijing so I couldn’t go very far and ended up acting as an impromptu photographer for some Spanish tourists while my friends continued further, haha. And we went on our own, without guide, so it’s nice reading the information you got from your guide. 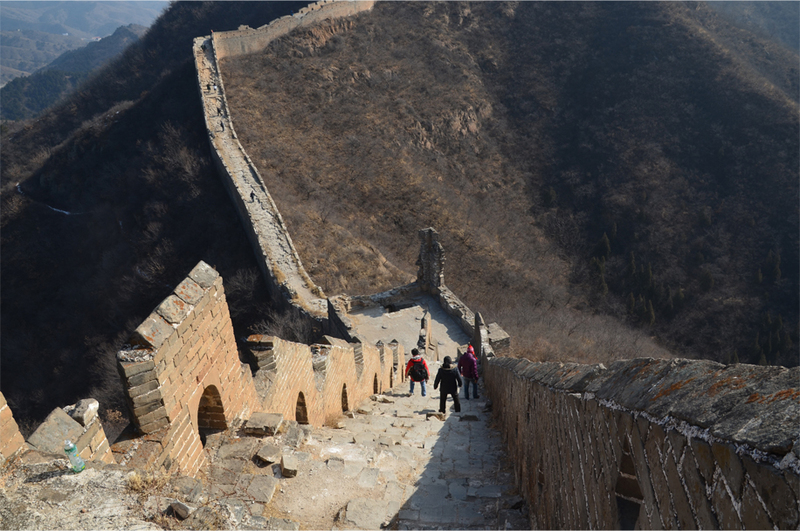 I’ve never been to Mutianyu, but it looks so steep from the pictures – perhaps even more so than the section I visited! It looks so? …Well, now I don’t really blame myself for not finishing the route! I wrote about my time in Beijing here: http://lompatlompat.wordpress.com/2011/04/24/beijing-tanpa-paket-tur/, but it’s in Indonesian. There are two pictures that I took in Mutianyu there. Thank you for writing, James. 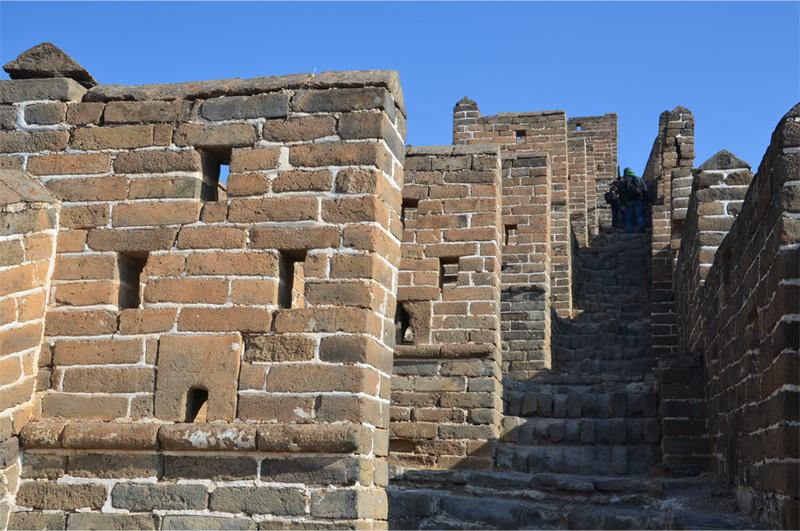 Having scaled the Great Wall myself, I enjoyed your article on a more personal level. Nice post! It reminds me of my favorite part of my Beijing trip last summer. A guide followed me, and I ended up with one of those T-shirts as well! Those ladies have incredible endurance, as I was dying on the way back down. I couldn’t believe it when she told me there were days she’d climb it twice! James, ¡me encanta tu estilo, gracias por compartir con el mundo! Your writing makes me feel almost as if I’d been present next to you! I suppose that’s the next best thing to being there, but either way, I am inspired! ¡Muchas gracias, Andrea! It had to be one of the most memorable moments of my recent travels, I was deeply touched by the encounter with Mrs. Zhou. Hai james, good picture and experience !. 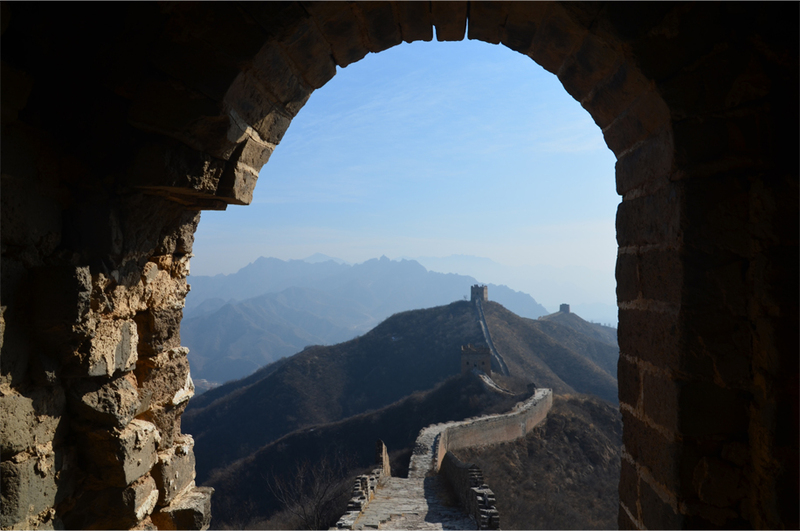 I hope someday i can see great wall panorama too.. I may never get to visit myself, but this is a beautiful blog post. Please visit the site for more of their amazing destinations. thanks for this post james.. my friends and i plan to visit the great wall this may..
Best of luck, fingers crossed the weather will be just as good when you get there! I was lucky enough to walk the Simatai section twice – had no idea it’s been closed since 2010! Thanks for bringing back some good memories. The people there are desperately poor, there were nearly some fistfights between them to decide who would get to carry some of my group’s bags to earn a little money. I can only hope that Simatai retains its wild charm when they have it reopened. Thankfully there were no fistfights between the local villagers when I was there; but it was humbling to see just how content my guide was. it was great! i mean great for the experience, the pictures, and great for you. u’ve been doing so well. Travel is getting more and more affordable these days, you should go! I think I enjoy reading about your experience with Zhou Qin more than the description of The Great Wall itself, that’s what travelling is all about for me. Awesome post, congratulation on the FP. Absolutely – it would have been far less of an experience if I hadn’t met her on the Wall. Thanks for dropping by! Great pics. China looks amazing. I really want to go to China. I was wondering if you could check out my blog. Come and see an 11 year old’s view on all things baseball. I’m impressed – I don’t think I was doing anything of the sort when I was 11! You could easily become a journalist / sports commentator / media personality later on in life. Keep it up! Not really, aside from the obvious adage that “practice makes perfect”. You just have to keep writing, and read articles to find out how other people are presenting their material. I could definitely visualise your articles being read out on the news, perhaps broadcasting could be an option when you eventually apply for college. But don’t worry about that yet – you’re only 11 once, so make the most of it! No problem David, best of luck! Fantastic, detailed blog! I will never travel to the wall and appreciate your images. As close as I will ever get to being there. Thanks. Amazing place and experience. One of those place I would love to go but probably will never get to. Thanks for the mini staycation to the great wall. Staycation – what a great portmanteau! I’m glad you enjoyed the post. I went there 2009, the same route. Your post reminded me of the great experience there! Really, I am so proud I did that :D.
I wonder how it must have compared to this time; perhaps Jinshanling was even less developed! Beautiful pictures, beautiful writing. Thanks! I thoroughly enjoyed that. You’re welcome, Meg. It was a real pleasure to write this up. Wistfully, awesomely lovely photos, but the story. . .just what I needed, one more thing to bring tears to my already overworked eyes. The items you purchased from Zhou Qin were more than a bargain compared to the advice she gave you — “Man man zou.” Walk slowly. Congrats on fresh press, and to WordPress for finding your writing. Thank you, I was really overwhelmed with the truths and lessons that Mrs. Zhou shared on the Wall. In the midst of our busy lives we often forget to count our blessings, and she reminded me to do just that. What could have been another boring story about a trip to the Great Wall turned into a beautiful and heartfelt story about a sweet tour guide named Zhou Qin and wonderful truths and information about the Great Wall not known until now. Thank you so much for sharing this story and introducing us to Ms. Zhou Qin. 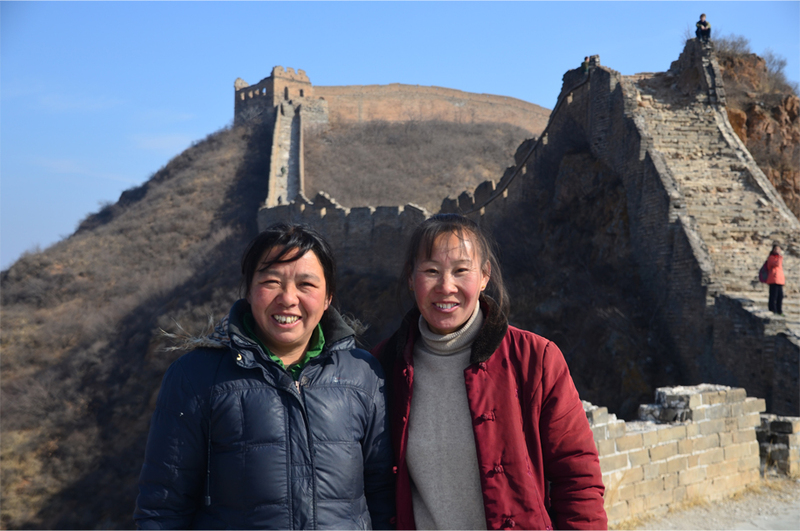 Before I got to the Great Wall I wondered if I was actually going to have a worthy story to share – but meeting Mrs. Zhou was the best thing that could have happened on the trip. She was so amazing; I would have to agree that she made the entire story worthwhile! Excellent pictures! Good writing with keen observation. I love the way you portray and quote the guide. Thank you! It was the last day of my trip but certainly the best. Beautifully written. The photots are amazing! Thank you. 🙂 Funnily enough, this blog started out as a way of narrating my ongoing love affair with Spain! Wonderful photos and wonderful written story … amazing to look at that wall. Imaging how many people it took to build it – did you walk the whole wall?? From your pictures to judge it look like it … or you walked a fair walk. This something big that we should real stop and take in. Oh no, it would take years to walk the entire length of the Wall! I only visited a very small section – the hike itself was not very long, maybe about 2 hours or so. It was supposed to be twice that but half the section was closed for renovations. Amazing place … and thanks for sharing – great writting and photos. Been to China quite a lot in the late 70th, but never made it to the wall. What a GREAT post! Congratulations on being freshly-pressed and on making it all the way to the Great Wall of China! I like your writing style! And thanks for posting those spectacular shots! I read your profile and saw that you’re living in Hong Kong of all places! I’m actually planning on moving to HK next year. What’s your experience there been like and how’d you manage to end up there? You got such an eye and word for details. I enjoyed much the reading. Thanks! Wow, James! I’m so happy to see you featured here. Well deserved! Thank you Sony – it was a real surprise!! Beautiful photos, the different angles of the wall and various perspectives are breathtaking. The weather was simply gorgeous that day – it made it so easy to take those photos. Some great pictures of the wall! I love it plus the story! Thanks for sharing your story. Every time I travel, it is so much more interesting to meet the locals than to do all the touristy things. I have written some travel stories and I hope you’ll enjoy them as much as I enjoy yours. The description does ring a bell – there are several famous mountains in China, all known for having a sea of clouds, but I haven’t yet made it to any of them! If you happen to have the chance to go to any of those places, write about it. At least that way I’d have a preview from you! Hehe. Anyways, I love your blog. It encourages me to travel more 🙂 And thanks for replying. Beautiful photos! My husband and I were in Beijing for the Olympics and were lucky enough to get to part of the wall. Fascinating construction and amazing history. We loved each turn and new view- but coming down became painfuly aware that each step was a slightly different height – Walk slow is great advice! Thanks for this beautiful post, and congratulations on beng Freshly Pressed! I couldn’t agree more – coming down was much harder than going up! Thank you for reading! Hey James, congratulations on being Freshly Pressed!!!!! It is a great post. Thanks Debra!! I haven’t visited your blogs for a while – it looks like there is a lot to catch up on! loved the way you write, it was like reading a book! congrats on FP! Thank you! One day I hope to make it over to Nepal! I hope you do, its a great place! I’ve just made a pic from this post on my blog. http://2bitsworthofthoughts.wordpress.com/2012/04/16/angeline-series-5/ Thanks for the permission. You’re welcome – thanks for the acknowledgement! Hi, James, These are great pictures! Which reminds me… I should go through my Inida pictures and post some. I log on to your blog on a regular basis. Having read this I thought it was rather informative. I appreciate you finding the time and energy to put this article together. I once again find myself personally spendinga significant amount of time both reading and leaving comments. But so what, it was still worth it! Thanks for the kind comment, Andy! Let me know if you do end up uploading your photos from India – I’ve never visited and it’s been on my radar for some time now! such beautiful photos! can’t wait to visit China! Thank you – China’s a tough but immensely rewarding destination! Your pictures are amazing. Just looking at those pictures make me want to climb the Great Wall of China now. In return, I also found a great blog of Jinshanling travel tips, I’d love to share it here with you and for future travelers. It is on my todolist as well ! You’re welcome, hope you get there soon! Such wonderful, insightful writing James, with beautiful photography to complement it! A Lesson on the Great Wall, Jinshanling | Bonjour! C'est moi.